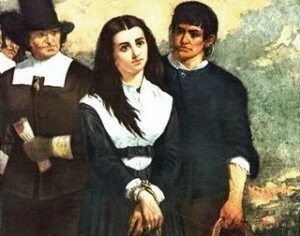 This June will make the anniversary of hanging of Bridget Bishop and the Salem Witch Trials. Who is this lady, and why is she important in the annals of Magick and Witchcraft? She occupies a very important place in the history of the Craft. She was the first of the Salem Martyrs, those people who were wrongfully murdered for supposed practicing witchcraft in Salem, Massachusetts in 1693. Her anniversary is June 10. Establishing the truth of a case over three centuries old is always difficult. However, we know her death was part of a general backlash against the idea of practicing Witchcraft. She is therefore important in the lore of the Craft, even if she was an innocent simply caught up in a public frenzy. In this article, we will explore her case, and try to gain a better idea of the concepts that surround the Witch Trials. In New England in the late 17th century, the idea of puritanism was very common. People lived in a way that had to stand up to the scrutiny of the church. Many people who had left Europe to come and settle in North America carried with them ideas and concepts about the power of Christianity. There was a belief that Satan himself walked the Earth, and that people had to take care in their daily lives not to be tempted by him. This developed beyond simple good living, to a puritan belief that unless life was lived exactly as directed in the bible, a fall into damnation would be unavoidable. In England in the 16th Century, this idea manifested itself in the form of Witch Hunters. The most famous of these men was Matthew Hopkins, who took advantage of the chaos of the English Civil War to publish ‘The Discovery of Witches’ in 1647. This book purported to show to identify those who were Witches, and under this dubious authority, Hopkins gained power and prestige, all the while imprisoning and executing innocent people – most of them women. By 1693, these ideas had crossed the Atlantic. In colonial Massachusetts, people eyed each other with suspicion. Sadly, the best way to avoid suspicion is often to be the most vocal in accusing others. We see this all the time in human behaviour. Bridget Bishop was a perfect target. She was a middle-aged and single woman, something that was viewed as very negative at the time. Her involvement in running tavern around the Salem area and her rumored involvement with gambling and games of chance added to this. She was a maverick, someone who we might view as ‘independent’ nowadays, but who back then was viewed as ‘dangerous’. 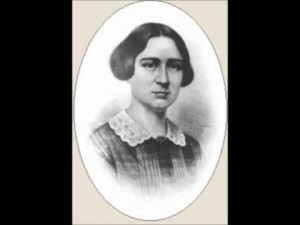 She had several marriages, and one of her husbands had died while married to her. Eventually, these events would come back to haunt her, as the trials got underway. The atmosphere of colonial Salem at this time was poisonous. There were constant rumours of war, as the small and colony of Massachusetts struggled to survive and deal with both conflicts with Native Americans and the chaos back in Europe. More locally, there were a lot of land disputes in the area, which led to an atmosphere of suspicion and recrimination. People didn’t get along in Salem. The arrival of a very strict Rev. Samuel Parris, who publicly punished those who sinned, added to the tense atmosphere. Eventually these spilled over into the Witch Trails. Evidence as flimsy as the way in which Bridget Bishop wore her coat was brought before a trial, which was described as chaotic and full of random accusations. Much of the evidence put forward depended on ‘spectral evidence’. This was people reporting that they had actual seen the ‘shape’ or image of the person who was responsible for their being cursed. Again, the most flimsy of evidence was brought forward. When we see the sorts of people that were targeted, they tended to be poorer, held in lower esteem by their local church, or simply unliked. Bridget Bishop couldn’t defend herself, so became the first victim of this shameful episode. What can we learn from the Salem Witch Trials? They remind us that the practice of Magick has long since been feared, as well as respected. Depending on the time, place and society, attitudes towards it have changed and flexed. Bridget Bishop’s case represents a low point. Sometimes we see in the news that this sort of attitude can re-assert itself in developing countries. Often we see how accusations of witchcraft can even be made against children. These sorts of problems usually grow out of another form of societal issue, like lack of resources or the inability of a family to take care of the needy. It helps explain why cases like Bridget Bishop’s are now so rare in developed and more peaceful nations. Such situations need the soil of chaos to grow and develop, and they fall apart when chaos isn’t present. What those of us can take from Bridget’s story is that there is often a lack of respect for Magick. This isn’t something that should put us off practicing these special arts. Instead it should fill us with a respect for our current abilities to touch the Craft. Many people fight through prosecution and difficult conditions to be able to use the hidden arts. Other people get swept up in mania when they may not even have involvement with Magick in any way. These difficult conditions, and the state of the world then, and now, make us pause for thought. Remember this June, that people who bore the title of ‘Witch’ were persecuted. Remember that we all have a duty to ensure this type of persecution does not happen again. Have you ever experienced discrimination due to your beliefs or practices? Do you find that there is still a stigma attached to the word 'Witch'? Please contact us via our Facebook Page to continue the conversation, as we would like to hear from you.